We can light a candle for you! We will light a wax candle in the upper church for your intention. Cost is $20 per month or $250 per year. You can make your gift online or by mail. If you prefer online, click Paypal under “Select Payment Method.” If you’d rather mail a check, click Offline Donation. When you click the offline button, you’ll view an invoice with instructions for mailing your check to the Shrine. Please include your prayer intentions with your check. May God bless you! Questions? Call us at 215-627-3080. 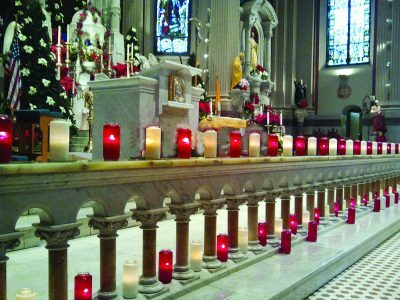 Make a check payable to "The National Shrine of St. John Neumann"
On the memo line of the check, please indicate that the donation is for "A candle at the shrine"
Include with your check any special prayer intentions you have. All gifts will be gratefully acknowledged and are tax deductible.